Me, on the Bus Today, on the Verge of the Verge of Tears . . .
". . . Usually, all we get is a glimmer. A story we read or someone we briefly met. A curiosity. A meek voice inside, whispering. It's up to us to hammer out the rest. The rewards of pursuing it are only for those who are willing to listen attentively, only for those people who really care. It's not for everyone. If we are the victim of an injustice, it is up to us to find a meaningful way to channel our anger. If we suffer a terrible crisis, only we can transform this suffering into a launching pad for a new life. These are the turning points from which we get to construct our own story, if we choose to do so. It won't be easy, and it won't be quick. Finding what we believe in and what we can do about it is one of life's great dramas. It can be an endless process of discovery, one to be appreciated and respected for its difficulty. Don't cheat. Treat this as the one true life you get." The multimillionaire owner of the company I work for went out alone on his sailboat twelve days ago and shot himself in the head. Today I was one of about 900 people who attended his memorial service. The Vice President of the United States and a former CIA director spoke. Reporters and cameras lined the perimeter of the cavernous, columned auditorium. There were major differences between him and Richard Cory -- in physical appearance, personality, and perception by those who worked for him (think of the opposite of all of those as they pertain to Richard Cory and you'll be close). But I can't help thinking of this poem anyway. Monday morning, when I read the headline in the paper stating how he'd died (he'd been lost for many days, the cause of his death a mystery until then), I flopped into a chair and exclaimed, "Oh, my God!" to nobody. It was strange to "mourn" a man who barely knew who I was during my 23 years of off-and-on working for his company. Last summer, at a goodbye party for a colleague who was leaving for a yearlong fellowship, the now-deceased man came over and congratulated me. I said, "Uh, he's over there." At least I can take comfort that one other person in that story was as invisible to him as I was. He was a successful, rich, loud, profane, impatient, savvy, ambitious, temperamental, bombastic, bullying man who also had a civilized, apparently respectful, and often even warm relationship with a lot of people. He seems to have been a genuinely good father, judging from his children's tributes today (though I'm really glad he wasn't my father). I realized today that the reason I was one of the relatively few people who worked "with" him but had virtually no relationship with him is that I'm quiet, keep to myself, don't promote myself or my work very much. I'm not a schmoozer, I'm not extroverted, I'm not a gladhander. My job is by nature behind the scenes, and my personality makes it more so -- after all, there are others who do what I do yet who knew and related to him in some fashion. The more significant realization, though, was that my immediate boss, the layer between me and his boss -- the deceased -- never touted me to him. Never said, "This is [Billy] -- he does X." Or "[Billy], come over here and tell _________ about that project you're working on." Or "[Billy] was responsible for that thing you were talking to me about." Those of my coworkers who had a relationship with __________ (and there apparently were more of them than I realized) had one, I believe, because they were championed in some way -- even a small way, even a superficial way -- by our immediate boss. If there was no championing, there was no reason for the Big Boss to even know who you were. So then why was I lying awake in the middle of the night last night, chilled by the thought of him alone on a vast body of water twelve days ago, putting a shotgun to his head? Why could I not get to sleep, wondering what he had said to his wife before leaving the house on a seemingly routine afternoon sailing jaunt? What else was I trying to feel? What else was I wishing I could feel? I was a little "off my game" tonight at Remington's, a tad stiff and self-conscious for some reason, but I had a good time anyway, all in all. Everyone there on Monday nights is unbelievably friendly and helpful (and forgiving). I think the duet, though, is only on Bon Jovi's new CD, which I will never buy. Not that I have anything against Jon Bon Jovi. In fact, in a weird way I've always kind of liked his "persona," and I see that the band is performing at a free screening of An Inconvenient Truth in LA later this month, so he can't be all bad. I've just never given his music a second glance -- until this very atypical song. It's a great one to two-step to, or to watch a dancefloor of guys two-stepping to. (It's also the number-one song on Billboard's "Hot Country Recurrents" chart, whatever that is.) The tempo is pretty fast, and if you have a leader who is good and who times the corner spins just right at the guitar moments (sorry to get all technical on you with terms like "guitar moments"), it can be as near to a transcendent experience as you can have in a gay country-western bar. Anyway, I didn't dance to it tonight -- they didn't even play it -- but like I said, I gave it a listen just now to lift my spirits. For some reason, I'm ending the day today feeling a little eh. But I feel better already. Why do I like this look so much? 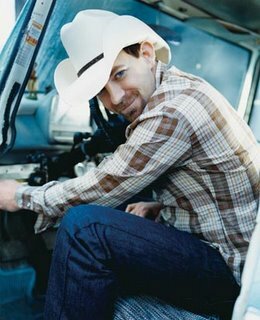 This is Kristian Bush, another member of Sugarland. I've been seeing a lot of this kind of cowboy hat lately, turned up on the sides. "This I Be . . . zzzzzzzzzzzzzzzzz"
For the past two mornings as I've walked the dogs, I've started to tear up as I've listened to NPR. Yesterday it was as a grown daughter interviewed her father for the StoryCorps project. The father raised four daughters while battling severe depression. He describes the condition as being like walking down the street at night when a huge dog charges you, growling and barking; that "moment of utter panic and fear," he says, is with you 24 hours a day. The daughter recalls, as a child, hearing her father crying in his bedroom at 5 a.m., "just terrified to take on another day." The story is a loving and poignant tribute to family and to prevailing over pain. This morning I got varklempt while listening to a show I'm only rarely up early enough to hear -- Soundprint. But a certain dog I know insisted on a walk earlier than usual and nothing else would appease her. Today's show, called "Making Faces," was about an improv workshop for kids with "facial differences" -- cleft palates and lips -- that helps them gain confidence and see that there are others like them after being hurt by bullying, stares, and name-calling their whole lives. Most of the show is fairly upbeat, but there's one moment when a little girl gets choked up while talking about the importance of getting to know the person inside the face, and her words did the same to me. The story wouldn't have had nearly the same effect if told by anyone else about her. It's the best kind of radio -- real people speaking unself-consciously for themselves. Speaking of which, is it just me or does anyone else think NPR's weekly "This I Believe" segment is the radio equivalent of a fourth-grade film strip on the wonders of agriculture? The first-person essays are so consistently stilted, musty, and boring -- I don't think my mind has failed to wander once while listening to them -- and such a missed opportunity that I've finally given up on even wanting to like them. One of their worst faults is their ponderous virtuousness. I blame the way they're selected and produced more than I do any individual story. Naturally, I saw in a publisher's catalog that an anthology of the essays will be coming out later this year. If you were to contemplate the semiotics of my facial hair, you'd probably find yourself using words like confusion, indecision, identity crisis. Yes, once again, I shaved, despite my prediction a mere two months ago that I would stick with the bearish look this time. I do think that my changing facial hair over the last year or so indicates more than a frequent desire have a new look. Another clue to my state of mind is my current reading: What Should I Do With My Life? : The True Story of People Who Answered the Ultimate Question by Po Bronson. I haven't finished it but am finding it inspiring. I sometimes wonder if people who interact with me from day to day have any idea how at sea I am about the shape I want my life to take in the coming years, and about how equipped I am to make some leaps of creativity and confidence, and to fit them in with the other components of my life. "Midlife crisis" would be the operable cliche, I suppose. But I so hate cliches. As I tell my students, you can always do better than a cliche. I had only a couple of hours at the library, so I can't wait to go back next weekend and continue. Now that I'm into it, it's very exciting to find these real-time accounts of my subject's splash onto the scene, so different from the path her life would ultimately take. A couple of weeks ago, I drafted a letter to her surviving sister and brother-in-law, telling them about my project and asking to meet them. I ran the letter by two dogged reporters I know and respect, and they said it hit the right notes, which I was happy to hear. But upon reflection I don't think I will send the letter for a while. I'm glad I got the words down, but now I realize how important it is for me to do a good bit more research before I approach the family. I want to come to them bolstered by as much knowledge as possible. In the meantime, I've ordered some personalized stationery from Crane's for when I finally send the letter. When I told a friend I'd done that, she said, "That's so gay . . ." But it wasn't in a belittling way. The rest of the sentence was " . . . so civilized." I told her I, er, hadn't really thought of it that way, but yeah, I suppose it is (gay, I mean; I'll leave the "civilized" part for my own biographers to decide, heh heh). She said in her next e-mail, "Honestly, can you imagine a straight guy ordering Crane's?" I said, "I can imagine a straight guy doing it 40 years ago, but you're right, probably not today." "To Use Another Human Being for One’s Own Political Gain Is Beyond Shameful, It’s a Sin"
Thanks to my sister-in-law for sending the following. All Souls is the church in which she and my brother were married. "My name is Robert Hardies and I’m the senior minister of All Souls Church, Unitarian in Washington, DC. All Souls is located just a mile or so down the road from the White House, and so today I’d like to issue an invitation to the President of the United States. I’d like to invite him and the First Lady to come worship with us at All Souls Church on a Sunday morning. Because there are families in my church I’d like to introduce him to. I’d like him to meet Steve and Barbara. "A few years ago, Steve and Barbara celebrated their 40th wedding anniversary with a party at our church. Forty years was an important milestone for them. You see, Steve is white and Barbara is black and when they tried to get married 40-some years ago in the state of Virginia they were told, 'No!' They were told that a white person marrying a black person violated not only the state’s anti-miscegenation laws, but the sanctity of marriage itself. Like so many couples back then, Steve and Barbara had to cross over the Potomac into the District of Columbia to get married. Pretty soon they moved here so as not to be rousted out of bed and arrested like other interracial couples in Virginia. "I’m hoping that Steve and Barbara can remind the President that the struggle for marriage equality has a longer history than some are willing to admit. "Then I’d introduce him to Kevin and Paul. They’ve celebrated a milestone, too. Not too long ago we held a blessing in church for their adopted daughter. You should’ve seen the crowd after the service. Dozens of would-be aunts and uncles gathered around the family, clamoring to hold the little girl. Kevin and Paul are thankful for the love and support they find at church, because the state still doesn’t recognize their family as legitimate. I’d like to give Kevin and Paul the opportunity to ask the President why their family shouldn’t receive the same legal benefits as other families. "In his press conference today, the President will use the language of values to justify his support of the Federal Marriage Amendment. And I want to acknowledge that people of good faith do differ on the issue of gay marriage. But I’d like to talk about values, too, and discuss for a moment the politics behind the Federal Marriage Amendment. "Let’s be honest with ourselves. There isn’t anyone in Washington who is naïve enough to believe that the introduction of this legislation now in two consecutive election cycles is anything but a politically motivated effort to win votes by demonizing a class of citizens. "For the President of the United States to write discrimination into the Constitution in order to boost his poll numbers is shameful, and a violation of his stewardship of the Constitution. But it’s worse than that. To use another human being for one’s own political gain is beyond shameful, it’s a sin. If the President were to go back and read the Book of Genesis he would be reminded that there it says all human beings are created in the image of God, and that they therefore possess sacred worth and dignity. You don’t use another human being this way. You don’t demonize them for your own political gain. That’s the very definition of sin. "In closing, let me make two predictions. First, this legislation will almost undoubtedly fail. It wasn’t ever intended to pass; it was only intended to mobilize conservative voters. And second, I predict that we’ll all be here again two years from now in 2008 when someone else thinks its good politics and again introduces the Federal Marriage Amendment into the national debate. "But I will work and pray for the day when the leadership of this country rises above the politics of demonization and instead sees fit to shower the blessings of this nation on all of our families. Thank you." Today I attended my nephew's high school graduation. He went to a venerable old Catholic boys' school that, when I attended another Catholic boys' school that was (and I assume still is) something of a rival, had a reputation (among us anyway) of being (how shall I say?) of slightly lesser gravitas and intellectual rigor. My envy and wistfulness might stem from the fact that I'm no longer in anything like regular touch with any of the 22 classmates from my graduating class. (My nephew's class had about ten times that many.) People do move on -- that's natural. And often for the best. The valedictorian today spoke to his classmates of "taking a piece of you with me wherever I go for the rest of my life." Part of me couldn't help thinking, Give it ten or fifteen years and see what happens. Another part thought, Well, good for you guys. Maybe you will. Yet another part thought, I actually probably do carry them with me more than I realize. My nephew, although way more athletic than I ever was (which is to say: somewhat athletic), doesn't fit the macho, jockish mold I sensed in many of his cohort. After a few sullen adolescent years of seeming remote and unknowable to me -- and going through some emotional issues of his own that I know only the half of -- he's now, at age eighteen, pleasant, articulate, relaxed, and funny. Thank goodness -- and I say that for his sake, not mine. It feels like it might be the beginning of getting to know him again. He's going to be studying graphic design at Penn State, and the star alumnus of his department is the hugely talented book-jacket designer Chip Kidd. A month or two ago at work, I received a review copy of a retrospective of the first twenty years of Kidd's career. I sent it to my nephew and got a nice note back from him. I didn't really feel like an uncle for a few years there, not in the way that I used to. Now I'm starting to feel like I might be one again. Funny. He looked very serious through the two-hour commencement -- "like he's sick to his stomach," my sister, his mother, whispered. In profile from where I sat, he looked so much like the little boy I remembered babysitting so many times! I hadn't seen that in his face in years. Afterward, when we met up with him on the athletic field for "refreshments" (canned soda), he looked happy. He and two buddies posed for pictures with their arms around each other, goofing for the camera. I never would have been so physical and openly affectionate with any of my high school friends, certainly not in front of my parents. I get the sense that he has a small circle of close friends, unlike some of the more bigshot of his classmates who had masses of people whooping and hollering for them when their names were called. Well, good for him for that too.